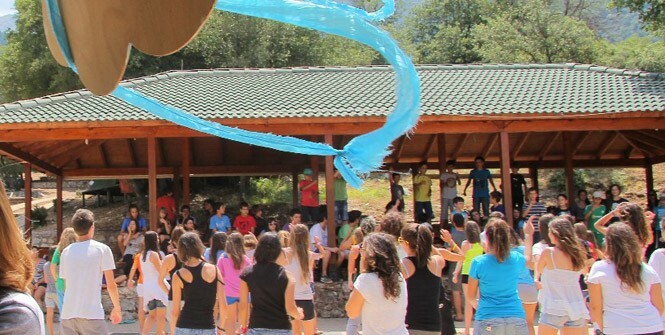 The wonderful camping programme of ECOCITY continues this year during the summer season in the magical and lush green Rodea, a specifically chosen area of Kalavryta, where the permanent facilitates of the Camp Centre for Environmental Awareness and Education are located. ECOCAMP, the environmental camp for teenagers, will be held for the 12th year starting at Monday July 30th until Sunday August 5th, in a fir forest, in a location of outstanding beauty at the foot of Mount Erymanthos, where our mythology has connected nature with legendary achievements and actions while our history binds tradition with respect for water and land. The programme of the environmental Ecocamp takes place where ancient heroes Heracles (Hercules) chased the Erymanthian Boar and where a living natural monument, length 100 meters and aged about 3,000 years, the “Historical Pausanias Vinetree” is. Legends connect the ” Historical Pausanias Vinetree ” with labour of Hercules, who chased the golden antler deer . The deer reached “Historical Pausanias Vinetree” in which puzzled her long hair deer and Hercules arrested her. Through a pleasant time living in nature and through the carefreeness of friendly group life, young campers will take part in themed activities about air, water and land, enriched with traditional cultural elements such as making bread and baking it in a wood oven, or growing plant and fruit crops. Young boys and girls will have the opportunity to live in spaces of natural beauty and follow α memorable and rewarding programme of informative, experiential and recreational environmental activities, will get to know the surrounding area through hiking and will visit beautiful locations on mountain bikes. Ecocamp is an action of the environmental NGO ECOCITY aiming at connecting the city youth with nature as well as in the experiential approach to environmental issues. The facilities including accommodation are permanent and include tile-roofed building of total capacity of 200 people, kitchen, medical care facility, sports courts, and swimming pool. The programme is open to young boys and girls aged 13-16. Parents requiring more information can contact ECOCITY during weekdays normal working hours at this number: 0030 210-6196757. The advantageous location of the campsite in the area of Kalavryta, offers the possibility to live in spaces of natural beauty and historical significance. In the ECOCAMP, the centre is teenagers and the aim is to encourage them to discover nature and become environmentally aware through the joy of companionship and friendship. The activities relate to ecology as well as traditional Greek culture. City-kids will have the opportunity to become aware of environmental issues and become acquainted with the biodiversity of our incredibly beautiful land.